At the end of last year, the Performance Platform team completed a (re)discovery project. We wanted to look at how people use data to improve performance. As part of this project we used Activity Theory to build personas. This helped us identify our primary user persona: Anna, the strategist. 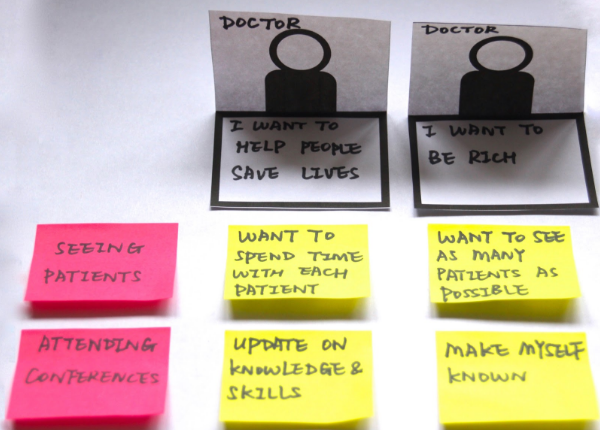 Personas have always been a controversial topic in user research. People tend to love them or hate them. I never used to be convinced about the value of personas. But this changed two years ago, when I was working with Charline Poirier, head of research at Canonical at the time. She introduced me to a framework based on Lev Vygotsky’s Activity Theory. Let’s say there are two doctors. One wants to help people and save lives. The other one became a doctor to get rich. They have the same job role. They appear to have the same goal and carry out similar tasks. But does that mean they would exhibit the same behaviour and needs? No. The two doctors’ different motivations would result in a variety of behaviour and needs. Some of these might be the same, but others might be contradictory. This is the value of Activity Theory. Rather than simply generating a list of needs in isolation, it adopts a holistic approach to understanding people’s activities. It explains actions and needs by exploring the context in which they occur. This allows us to see the reasons behind these actions and needs and hear what people do not say. This makes Activity Theory useful in constructing research questions for user research and in guiding the analysis for identifying personas. goal and motivation: what is the person trying to achieve, and why? needs: what needs does the person have in the context of motivation and goal? activities/tasks: what kind of activities does the person carry out and why? environment: what is the person’s physical and social context? interaction/community: who are the people and communities the person is interacting with, and why? tools/objects: what are the tools/objects the person uses, and why? rules: are there any rules governing their decisions and actions? I found the last element particularly interesting as it shows how people can prioritise one thing over another when they face tensions. The choices they make often reveal their motivation. We also added additional elements, such as ‘performance’. These were either specific to our project, or were new themes that emerged during the analysis. 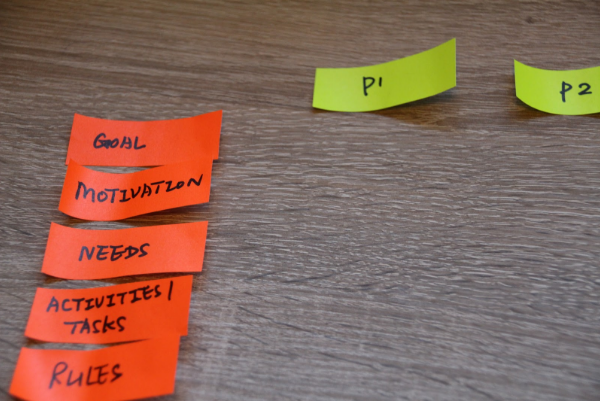 Analyse each individual according to this framework, using sticky notes. It’s important to arrange the framework elements vertically. This makes it easier to compare between individuals. And makes it easier to add to or move the research around. Transfer the sticky notes into a digital format. This process lets you sense-check the analysis results and spot any gaps that need more work. Identify personas considering the bigger context. We compared the similarities and differences between individuals in terms of the Activity Theory framework components, while referring back to the context of each individual. We then grouped people with the most similar patterns to form one persona. For our project, we interviewed 55 people, ranging from Executive Directors and Analysts to Open Data Activists. We identified 7 personas, including Anna the strategist, our primary persona. We will iterate the Anna persona as we conduct more research with users. This is because personas should not be something static and created once. They should be living documents that reflect our increasing understanding of users. Keep in touch. Sign up to email updates from this blog. Follow Tingting on Twitter. Nice to see AT getting some attention - if you want to delve a bit more into its relevance for / application in design I've written about this in my previous life as an academic ... http://www.sciencedirect.com/science/article/pii/S1071581900903768?via%3Dihub . Feel free to drop me a line. Hello Cat, thank you very much for sharing : ) It will be great if we could catch up and discuss this! "Built from the real words of real buyers, a buyer persona tells you what prospective customers are thinking and doing as they weigh their options to address a problem that your company resolves. Much more than a one-dimensional profile of the people you need to influence, or a map of their journey, actionable buyer personas reveal insights about your buyers’ decisions — the specific attitudes, concerns and criteria that drive prospective customers to choose you, your competitor or the status quo. "A buyer persona is not merely a description of your buyer. As hundreds of our partners and customers can tell you, simply profiling your buyer results in too many personas and not nearly enough marketing guidance." very useful. Would be great to have chat about AT if possible . Best. It is a shame your example used a scenario applicable to doctors working outside of the NHS, as it adds to the misconceptions that currently abound. NHS doctors do not get paid for seeing patients. We are mostly salaried to do everything that is necessary to ensure good patient care and fulfil Government targets. We are assessed, appraised, validated and monitored on everything we do but are not paid in proportion to this. This is an interesting concept, but the example used is not a scenario applicable to doctors working in the NHS. NHS doctors do not get paid for seeing patients. Whether employed or self-employed their pay is largely independent of what they do as an individual. So I imagine that for this theory to work a starting point must be to accurately ascertain the job description and payment structure of the a person's role before developing the behavioural models, otherwise popular misconceptions could cloud any useful research. Thank you very much for your comments. As you observed, the example I used is not based on doctors working in the NHS. You’ve made a good point, and next time I'll be more careful in choosing the examples. In terms of ensuring that popular misconceptions do not cloud any useful research, I totally agree. That’s why it’s important to build personas based on real user research data rather than our assumptions. The activity theory framework allows us to not only understand one’s job role, and organisation process/structures (e.g. the couple of things you mentioned), but also allows us to dig deeper into behaviour and motivations. It would be useful to also ask Cat Macaulay (someone who also left comments here) as she has written papers about the relevance of activity theory for / application in design. I hope these would help a little.